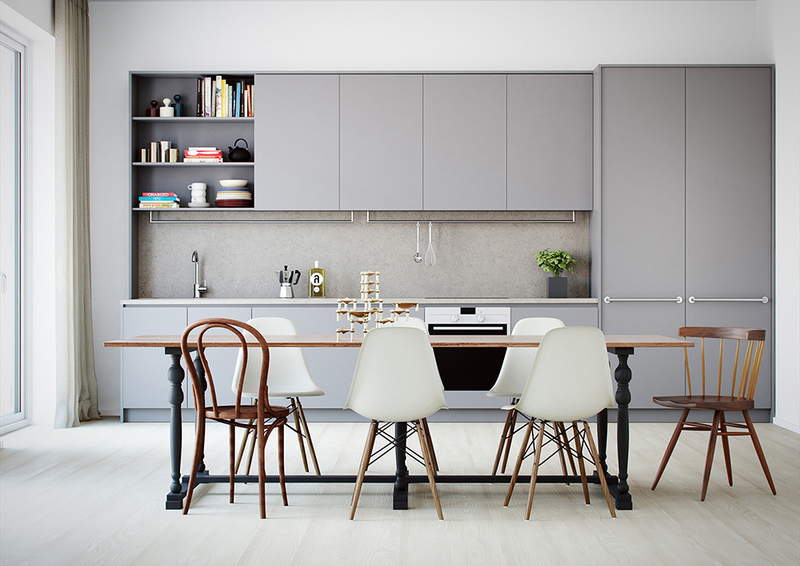 I like the grey color of the cabinets of this kitchen against the soft wooden floor and the black legs of the tables. The colorful cookbooks really get the attention, which makes it a little playful as well. Ik vind de grijze kleur van de keukenkastjes tegen de zachte houten vloer en de zwarte tafelpoten mooi. De kleurrijke kookboeken steken er ook echt uit, wat het geheel ook wat speelser maakt. This entry was posted in Uncategorized and tagged Eames, Thonet. Bookmark the permalink. Congratulations for your work and blog. I was wondering where to find a such a nice bar to hang kitchen accesories. I like the vertical fixing instead of the classic horizontal one. Thanks so much, it’s very nice to hear you like what I blog. I’m not entirely sure where you would be able to find that exact one (I can’t really see it that well either), but I bought one very similar to that one in Ikea, it’s called Grundtal if you would like to look it up. It comes in different sizes and I like it a lot. Hope this helps ! Love this reference. Do you know where the dining table is from? It’s perfect for something I have in mind. Unfortunately I don’t know which brand the table is from. I’m sorry I can’t help you further. Hi, I love the colour of the kitchen. Do you know what colour /product it is? Hi Nathalie, It’s indeed very nice, but I don’t know which brand this kitchen is from. This is such a beautiful kitchen! Do you know what material the worktop is?